The holiday season is rife with images of ribboned gifts, reindeer-led sleighs, and friends and relatives in their holiday finest. And with the holiday season comes holiday entertaining at home: cocktail parties for colleagues, family dinners, New Year’s Eve blowouts for your 100 nearest and dearest. No matter the gathering, these stylish holiday table setting ideas will set the stage for your holiday entertaining and all year-round. Create a statement on your holiday table with these elaborate dining plates. From the Emperor’s Garden collection by Sieger by Furstenberg, these plates flaunt festive colors and hand-gilded motifs that will set the tone for a lively holiday party or gathering. Set the stage for your holiday table settings with sophisticated linens. These placemats come in an array of color combinations, including white with coral trim; are machine-washable; and require no ironing. So, they’re sure to last for holiday seasons to come. Coordinating napkins are available, too. Bring charm and whimsy to your holiday table with these napkin rings. Soft strands of brass “twine” add just the right amount of the metallic trend, and these rings will complement any napkins. 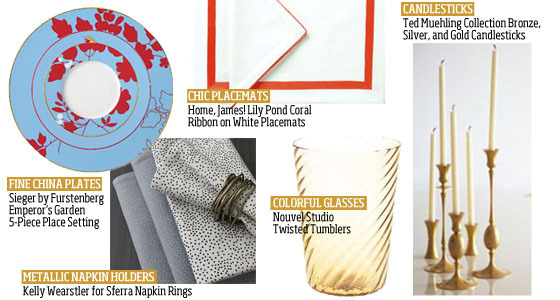 Glam-up your glasses with these gold Twisted Tumblers from Nouvel Studios. If gold doesn’t raise your spirits, you can enjoy your party cocktails in the red, gray, or aqua glasses, too. Add E.R. Butler & Company’s Ted Muehling candlesticks to your table centerpiece for all of your holiday entertaining. Combining 3 basic shapes, Muehling’s candlesticks come in 19 different designs. Available in oxidized bronze, Sterling silver plate, or gold, these candlesticks are sure to brighten up your party decór. Win a Basket of Fashion & Beauty Goodies! ’Tis the season to give, and we want to give you a basket of fashion & beauty goodies filled with some of our favorite products! To enter to win, tell us what is at the top of your holiday wish list and why. For contest details and to enter for a chance to win, click here.